The NSW Aboriginal Arts and Cultural Strategy 2011–2014 (AACS) was developed to foster a vibrant Aboriginal arts and cultural sector that affords Aboriginal people greater opportunities to participate in, share and strengthen their culture through arts practice; and develop careers and businesses in the arts and cultural sector. 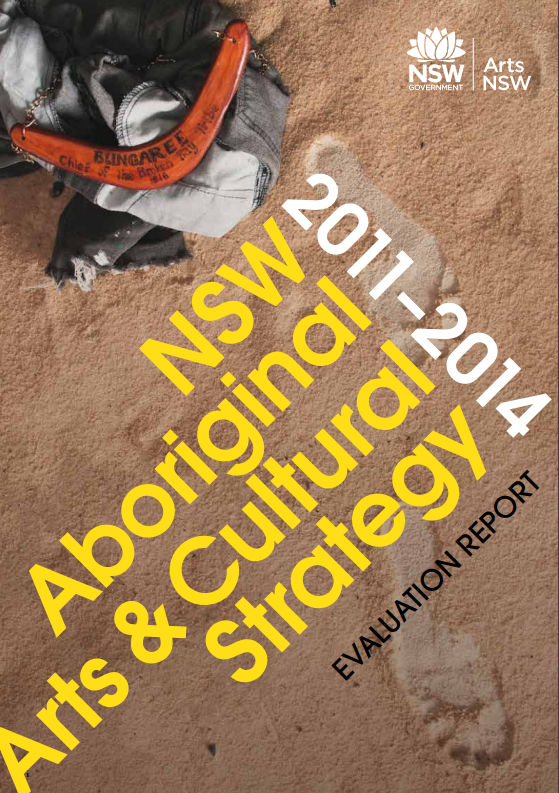 The NSW Aboriginal Arts and Cultural Strategy was developed and implemented by Arts NSW, included a commitment to evaluation of the effectiveness of the Strategy. The evaluation report of the AACS 2011– 2014, was undertaken for and in consultation with Arts NSW by independent arts consultant Lois Randall. Research into acquitted projects and development of case studies relating to the four strategic directions of Artists, Visibility, Community and Jobs. VISIBILITY – There has been an increase in recognition and appeciation of distinctive NSW Aboriginal Arts and Cutural practice. ARTISTS – The pool of skilled NSW Aboriginal artists and arts workers is still small.